Archaeologists from Binghamton University concluded their research project for this season at the Sea Pines Shell Ring today, July 13th. Their work included mapping and excavations to investigate the history of this ancient site. We extend a special thank you to Dr. Matthew C. Sanger (Assistant Professor, Dept. of Anthropology, Co-Director of MA Program in Public Archaeology Binghamton University) and his team for providing a group of fifty property owners the opportunity to interact and learn firsthand. 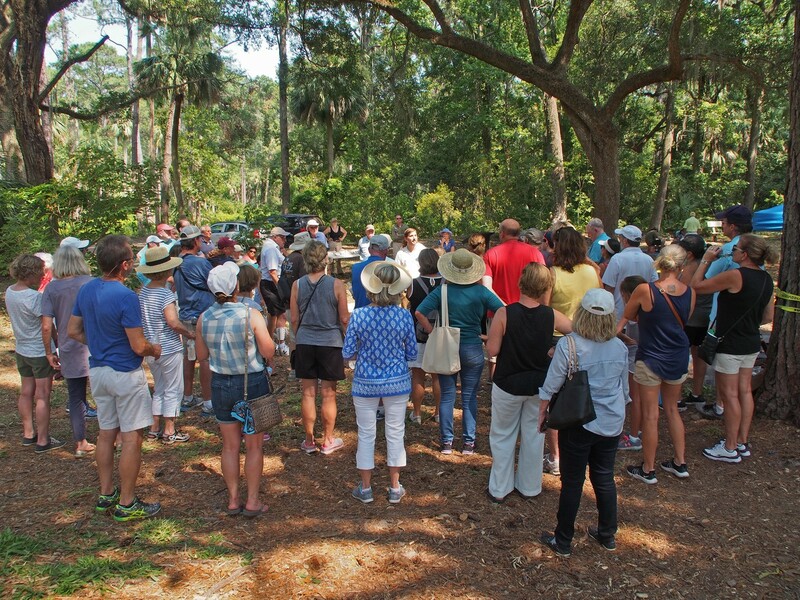 The property owners were divided into small groups allowing them to visit multiple stations where different aspects of the archaeological research and history behind it were explained. The Forest Preserve Committee, including Lauri Allenbach, Pam Green, and Rosemary Kimball, provided refreshments for all to enjoy at the conclusion of the event. We will be planning another Forest Preserve event. Stay tuned for topic and time.